432 pp., notes, bibliog., index, 6 x 9 in. Today’s world is shaped by an obsession with cultural difference that penetrates everyday life and matters of state in unprecedented ways. Culture and cultural difference are commonly used to explain everything that’s in the news – from wars to economic development and consumer behavior. This fuels the belief that our world is shaped by clashing cultures, a view that is counterproductive when it assumes falsely that culture is a timeless container that traps nations and ethnic groups. Seeing Culture Everywhere challenges the misguided and dangerous global obsession with cultural difference and directly critiques the popular notion that world affairs are determined by essential civilizations with immutable and conflicting cultures. 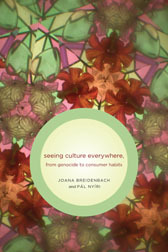 The book offers an alternative view of a world in which cultural mixing, not isolation, is the norm, but where several historical trends have come together at the beginning of the twenty-first century to produce the current wave of “culture think.” Brimming with concrete examples that move from genocide in Rwanda to schools in Berlin, from the Chrysler boardroom to the war in Iraq, it contemplates how ethnic identity can be mobilized in the service of all kinds of goals – violent or nonviolent, laudable or despicable – and the unintended effects such mobilization invariably produces. The authors suggest ways to remain sensitive to the cultural impacts of policies and decisions without falling into the traps of determinism, essentialism, and misrepresentation. Seeing Culture Everywhere will be useful in the fields of anthropology, law, intercultural communication, and international relations, as well as for general readers interested in ethnicity and travel. Joana Breidenbach, an independent anthropologist, journalist, and social entrepreneur who lives in Berlin, is author of Tanz der Kulturen (The dance of cultures) and coeditor (with Nyiri) of China Inside Out. Pal Nyiri is professor of history from an anthropological perspective at the Free University (VU) of Amsterdam. He is the author of Scenic Spots: Chinese Tourism, the State, and Cultural Authority and Chinese in Eastern Europe and Russia. But isn’t this a false antinomy? Can’t you have degrees of isolation – from North Korea at one end of the spectrum to Luxembourg at the other? And without sustained cultural differences how can you have cultural mixing? Surely Mongolia, Liberia and Finland are culturally radically different? And how much mixing is going on among them? Presumably far less mixing than amongst the three Benelux states?